Writing about a character who’d been a pharmacist in 1901 small town America presented a challenge in research. After all, this gentleman was practicing his craft prior to the passing of the Pure Food, Drug and Cosmetic Act of 1907 and national legalized standards for the profession. 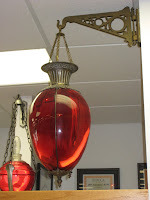 A link for the William and Joan Soderland Pharmacy Museum web site grabbed my attention. Colorful photographs of beautifully crafted glass jars filled with colored liquid, called show globes, fascinated me. Chemists, later called pharmacists, had made many of their medical preparations from herbs. 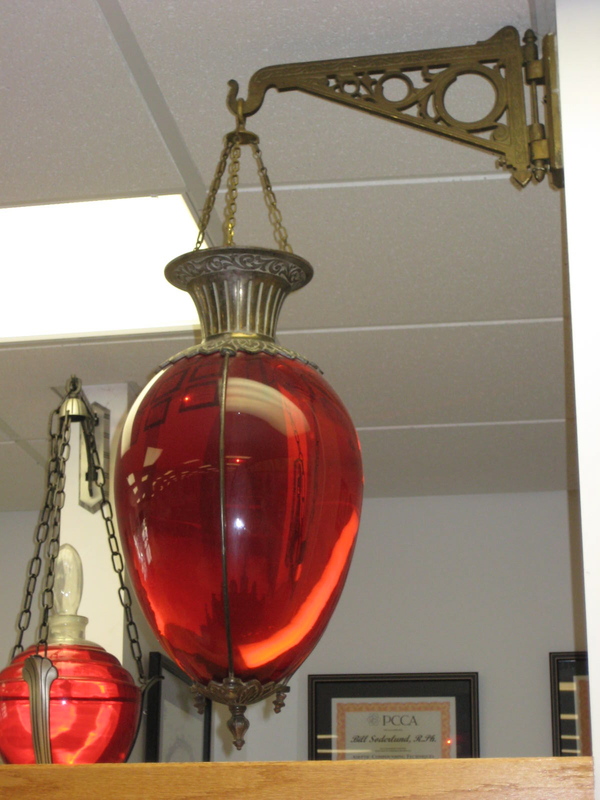 Since the historical pharmacist didn’t need a formal education or a license to practice until the 20th century, they demonstrated their prowess, in making chemical compounds, displayed in show globes. They sometimes layered different densities and colors of liquids for a striped effect. quaint St. Peter, Minnesota while visiting cousins in the Minneapolis area. Along most of the back wall stood cabinets filled with bottles, jars and boxes that once held patent medicines and individual ingredients. It would have taken hours to study the many labels of the lotions and potions contained behind the glass. These donated items span decades of the apothecary's trade and include familiar herbs and plants, as well as once popular patent preparations such as Lydia Pinkham’s Vegetable Compound and Dr. Pierce’s Favorite Prescription Tablets. often turned to Lydia Pinkham’s Vegetable compound familiar remedy. The old saying attached to this mixture was “a baby in every bottle”. Though it contained herbs known today for helping with some hormonal complaints, it was likely the high alcohol content that calmed nerves and dulled pain. Even women in the temperance movement were fooled by Lydia’s wholesome advertising. was also for female complaints, but he didn’t hesitate to come up with a variety of nostrums. His business, with its “world dispensary” in Buffalo, New York, , profited much from ladies seeking relief in the early 1900s. “Patent” medicines have a long history. The term originated from a British practice abolished by law in 1624—the purchase of royal favor to increase one’s competitive edge in the market. Later, in America, patents were given out for the design of the package rather than its contents! Not until the Pure Food and Drug Act of 1906 was passed did federal law regulate ingredients. license stating they were doctors, often gaining the potential buyer’s trust. Traveling medicine shows stirred the dust of sleepy towns, bringing the excitement of music or other forms of entertainment to draw their wary customers. These showmen sold “snake oil” liniment, made popular by the claims of a Montana rancher, among other panaceas. Though some remedies sold during the second half of the 1800s may have contained tried and true herbal ingredients, most of them likely dulled or covered symptoms with their large alcohol or narcotic content. often caused further illness and the misery of addiction rather than a cure. Even the popular beverage, Coca-Cola, made consumers feel good, with its cocaine content, from 1885-1890. 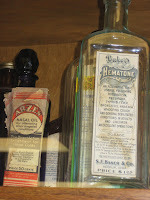 Patent medicines were often found on the shelves of trusted local merchants and druggists, well into the 20th century, though with less addictive ingredients by that time. As I studied the faded labels on dusty glass bottles I wondered which ones my grandparents or great-grandparents used? in 2014. I was thankful to have had one opportunity to soak up the ambience of the typical Main Street pharmacy of yesteryear before it was gone . . . into the past. Have you or anyone you know had the pleasure of visiting the Soderland Pharmacy Museum? If you did, what did you think of it? Please leave a comment below and your email address to be entered in a giveaway for a copy of my book, Brave New Century. Kathleen Rouser has loved making up stories since she was a little girl. Her debut novella, The Pocket Watch, is part of Brave New Century, a Christian historical romance anthology, published in 2013. Her short story, “Special Assignment” was included in the 2014 bestselling anthology, Christmas Treasures. Her first full-length novel, Rumors and Promises, will be published in April, 2016 by Lighthouse Publishing of the Carolinas. 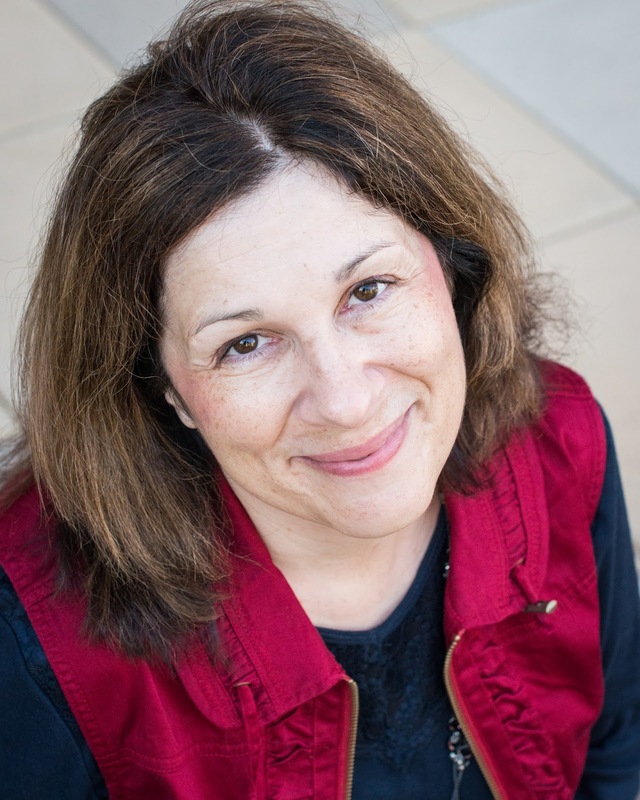 She has had several magazine articles published and contributes regularly to Novel PASTimes, a blog devoted to promoting mainly historical Christian fiction. She is a long time member in good standing of ACFW and a former board member of its Great Lakes Chapter. Hi Kathleen. While I never visited that place, I think it's history is fascinating. I recently heard that women sometimes became addicts because of drugs they were routinely given. Definitely, Rebecca. It's kind of scary they thought they were taking something good for them. I visited an Appothecary in Niagara on the Lake, Ontario many years ago. It was quite fascinating. I believe it has been made into a museum so one can perhaps still visit and soak in what once was. :) Thanks for the giveaway - I would love to win! shop in Colonial Williamsburg, which originally piqued my interest. I never had the pleasure of visiting the museum but how interesting that must have been. Thank you so much for sharing. You're welcome, Melanie. Thank you for stopping by. An interesting post, Kathleen - thank you!! I've never visited the museum - I do remember going to the corner pharmacy in my small town, which had a soda fountain, when I was a young girl. Wonderful memories!! Thank you for sharing, Bonnie! I've never been to the Soderland Pharmacy, but there is a cool, old pharmacy in Guthrie, OK. Lots of wonderful old bottles and paraphernalia. who once had them in their possession. 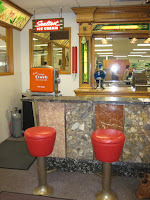 I have never been to any pharmacy museums, but I have been to many old soda shops. Thanks for having the giveaway. Thank you for stopping by, Rose. I've never been to a pharmacy museum, it sounds interesting. I am a pharmacy technician and it sounds like we have come a long ways! I've never been to an old-fashioned soda shop but have visited many of the silver streamlined diners which are from a similar era. work. Thank you for sharing. My grandfather was a pharmacist when no college was necessary. 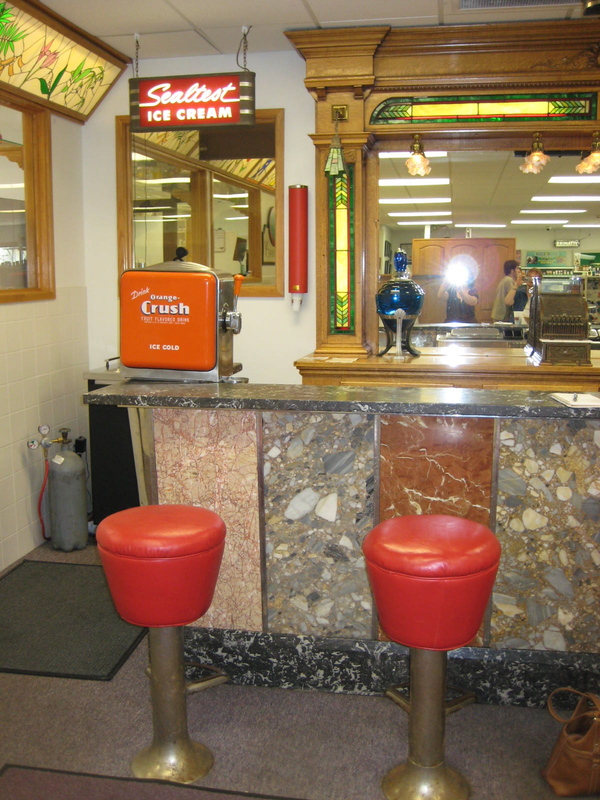 And when he had his own drug store, my dad worked the soda fountain. I've heard a lot of stories about that. No, I haven't had the opportunity to visit this museum but I thoroughly enjoyed this post. It is amazing how many times "tee-totalers" have used the wonder drugs and sang the praises, never realizing how much alcohol they were ingesting! Thank you very much, Anita Mae! Terri Wangard! Congrats, Terri! I will contact you shortly.